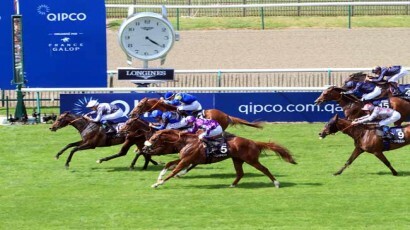 L’hippodrome de CHANTILLY accueille le Quinté du dimanche 03 juin 2018, le Qipco Prix Du Jockey Club (R1C5). Cette course de plat, d’une distance de 2 100 m, accueillera 17 chevaux pour une allocation de 1 500 000 €. Départ à 16h15. 1 Olmedo M3 1p 2p (17) 2p 2p 1p DEMURO C. ROUGET (S) JC. 2 Al Adaid M3 1p 3p (17) 2p BENOIST G. FABRE (S) A. 3 Dice Roll M3 3p 1p (17) 1p 1p 4p 1p SOUMILLON C. CHAPPET F.
4 Hey Gaman M3 2p 3p (17) 2p 1p 1p 12p 1p 9p 2p DOYLE J. TATE J. 5 Intellogent M3 1p 3p 2p (17) 1p BOUDOT PC. CHAPPET F.
6 Patascoy M3 2p 1p (17) 3p 1p 4p 1p BARZALONA M. THOMAS DEMEAULTE X. 8 Naturally High M3 1p 1p (17) 2p 9p BACHELOT T. BARY (S) P.
9 Not Mine M3 2p 6p (17) 1p 4p PESLIER O. FERLAND (S) C.
10 Study of Man M3 1p 2p (17) 1p PASQUIER S. BARY (S) P.
11 Louis D'Or M3 0p 3p 5p (17) 2p 1p 3p 2p 3p 3p HAMELIN A. CASTANHEIRA (S) T.
12 Stable Genius M3 3p 3p 1p PICCONE T. CHAPPET F.
13 Key Victory M3 1p (17) 1p BUICK W. APPLEBY C.
14 Flag of Honour M3 5p 3p (17) 1p 5p 1p 9p LORDAN WM. O'BRIEN AP. 15 Hunting Horn M3 3p 3p 1p (17) 2p 4p HEFFERNAN J. A. O'BRIEN AP. 16 Kenya M3 7p 3p (17) 1p 1p 3p P B BEGGY O'BRIEN AP. 17 Beat Generation M3 3p 5p LEFEBVRE F. O'HALLORAN MLLE C.
18 Rostropovich M3 1p 4p (17) 3p 1p 3p 1p 7p MOORE RL. O'BRIEN AP. Le triomphe de Study Of Man (10) et Stéphane Pasquier, qui offrent un sixième Prix du Jockey Club à l'entraîneur Pascal Bary.